TAMIYA 78022 JAPANESE LIGHT CRUISER MIKUMA (1/350)! 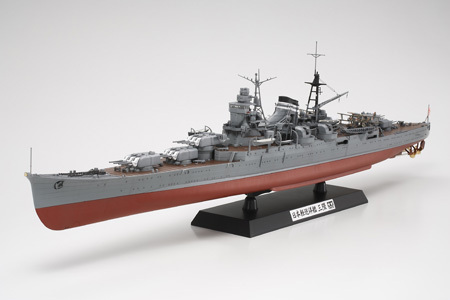 • This is a 1/350 scale assembly kit model of the Japanese Light Cruiser Mikuma built under the London Naval Treaty, which featured five triple 15.5cm gun turrets. • You can choose to build either a waterline or a full-hull model. • Assembly of the deck and hull for such a large model is difficult, but this kit includes reinforcing frame parts and screws to enable accurate assembly for both WL and full hull models. • The display stand securely attaches to the hull via screws. • Display stands for the highly detailed float planes are included allowing you to also create a flying diorama. • High quality photo-etched parts to depict details such as float plane propellers and crane are included. • The masts and radio antennas are made of reinforced ABS resin. • Metal plated shaft is used for the screw shaft. The anchor and chain are also depicted with metal parts.